Three more Palestinian prisoners have joined the ongoing hunger strikes against administrative detention, Israeli imprisonment without charge or trial, as of Sunday, 26 August 2018. The Popular Front for the Liberation of Palestine’s prison branch said that three administrative detainees held in Megiddo prison will join the strike in order to escalate the struggle against the arbitrary imprisonment of Palestinians. The PFLP statement noted that the three prisoners refuse to reveal their names at the present time and have spent years in prison over different sentences. They join three more Palestinians currently on hunger strike amid an ongoing boycott of the Israeli occupation military courts by all of the over 450 Palestinians jailed without charge or trial. There are approximately 6,000 total Palestinian prisoners. The administrative detainees have boycotted the military courts since 15 February and are demanding an end to the practice of administrative detention. Palestinians can be jailed for up to six months at a time, but the orders are indefinitely renewable. This means that many have spent years in prison through repeatedly renewed detention orders. Administrative detention orders are issued without charge or trial on the basis of secret evidence. Saddam Awad, 28, from Beit Ummar village near al-Khalil, and Khaled al-Battat, 46, from Dhahriyeh, have been on hunger strike since 12 August at the Negev desert prison; both are demanding their release from administrative detention and an end to the practice. In addition, Omran Ahmed al-Khatib, 60, from the Jabalia refugee camp in Gaza, has been on hunger strike for three weeks. He has been held in isolation in Ashkelon prison since he launched his strike; he has server 12 years of a 21-year sentence. His health has declined precipitously yet he has been denied medical release. 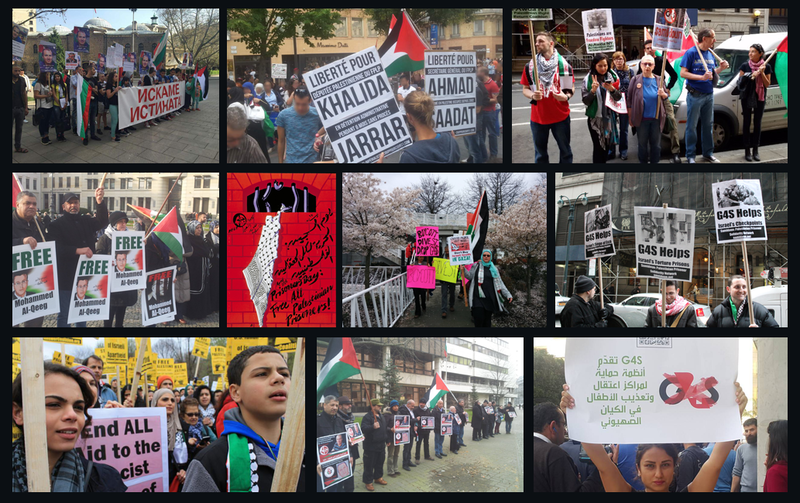 Samidoun Palestinian Prisoner Solidarity Network urges the escalation of protests and actions in solidarity with the struggle to end administrative detention. Administrative detention is a colonial weapon used to separate effective leaders from the Palestinian people through arbitrary imprisonment without charge or trial. It is also a form of psychological torture for both prisoners and their families, denying them even the knowledge of when or if they will be released. We urge the immediate end of the practice of administrative detention and the release of all Palestinian prisoners. As the prisoners boycott the military courts, it is our responsibility to escalate boycott, divestment and sanctions campaigns to isolate the Israeli state that confiscates Palestinian land, rights and freedom.